It’s one of the main takeaways from last year, when Gethard’s biggest regret was an episode featuring Timothy Simons, hypothesizing an alternate reality where Gethard had gotten Simons’ role on Veep and Simons was hosting a talk show. 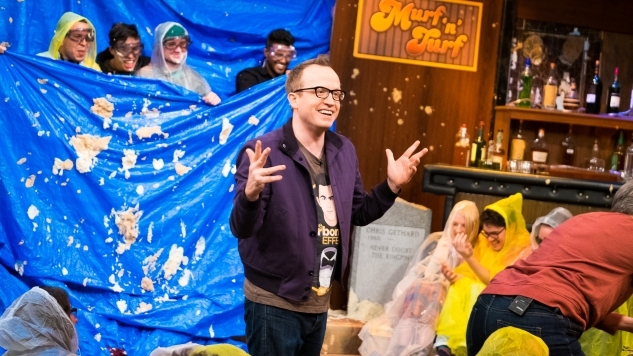 “We tore down our set completely and built it back up all in the course of a commercial break…” says Gethard. “And we did it so well that everybody watching thought we had just pre-taped it… To me that’s just proof that my show is not at its best when it goes well.” Though, not to editorialize, but since an entertaining show is, after all, a show that goes well, it may be more that the Gethard Show thrives when the possibility of actual, unentertaining failure is immediate and real. This disposition, one that defines Gethard’s interests as well as many of his fan’s, is perhaps most evident in his curation of the show’s musical acts, which run the gamut from bands whose primary successes were a little while ago (Less Than Jake, They Might Be Giants) to underground bands with smaller but extremely devoted fanbases (PUP, The Front Bottoms, Mal Blum). Their inclusion on the show is something Gethard has fought for, and it’s something he’s proud of. “As far as things that feel like hungry artists who are motivated to go out there and do some damage, I think we’re the ones putting those people on TV most consistently,” says Gethard. “I just really don’t have interest in dealing with A&R reps who are trying to push product for bands who are already well on their way to becoming millionaires.” It’s also a responsibility that goes beyond preference and principal—a matter not of paying it forward but paying it back. As much as ‘comedy is the new punk rock’ (punk is the most well-represented genre on the show’s lineup) has become a somewhat tired point of comparison, The Chris Gethard Show is probably a case where its an appropriate one. “A lot of people say that comedy has come to occupy something in young people’s minds in the same way music did for my generation,” Gethard notes. “You identify yourself by the bands you like—you identify yourself by the comedians you like.” And when it comes to Gethard himself, those two fanbases are most definitely all in one place.